Moroccan king rules over a population of over 33 million. Indeed, Morocco is by far the largest monarchy in Africa. About 99% of the population are Muslims and the highest mosque in the world is in this country. King's personal wealth is estimated at 2.5 billion dollars. On this day the current reigning King Mohammed VI of Morocco came to the throne. His country is today the largest Muslim kingdom in terms of population (only Saudi Arabia extends over larger territory). Indeed, Morocco is by far the largest monarchy in Africa. Moroccan king rules over a population of over 33 million. About 99% of the population are Muslims, and the highest mosque in the world – Hassan II Mosque in Casablanca (named after the king’s father, Hassan II, who ruled just before him) is located in this country. Its minaret is 210 meters high, higher than any Christian church in the world. Moroccan King Mohammed VI has a university education and he obtained his PhD in law from the French University. It is interesting that his thesis was on relations of European Union and Maghreb countries. 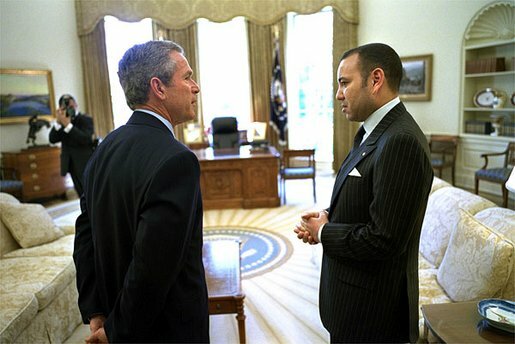 Mohammed VI became the king as a relatively young man, at the age of 35. In the framework of the Muslim-Arab world, he can be classified as an advanced ruler, and his reign is marked with a number of reforms (women’s rights, human rights, etc.). However, the Moroccan king has retained considerable power over the state. His personal wealth is estimated at 2.5 billion dollars. The king has only one wife, but she does not have the title of a queen, but of a princess (Her Royal Highness Princess Lalla Salma).